My Digital SLR , Pentax *istDS. This is my DSLR , *istDS of Pentax. It is succession of *istD and MZ-S. It have 2" of back-preview-LCD. and its quality is best of others , I think. Slower AF speed than other DSLR bodies. But perfect compatibles with Pentax-K mount even m42 screw mount with adaptor (m42 to P-K mount adpator). 600mega pixels is enough to me. Pictures not concludes with camera pixel resoultion. This is my film SLR , Pentax P3. It supports only 1/1 to 1/1000 , Bulb , 1/100 with flashing shutter speeds. But I can use my pentax(or compatibled) lenses with *istDS and it. 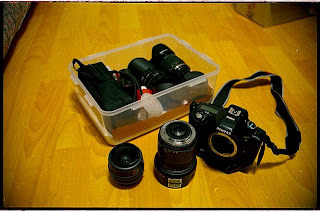 Actually, I have only one bright single focal lense , Pentax SMC FA50mm f1.4 among my lenses. It's very good to taking any shot my SLR and DSLR. Some people calls it as "hidden limit lense". Because of it, Pentax makes limited lense, for high quality and named "limited". Pentax P3 is a black-simple-automated film SLR body.